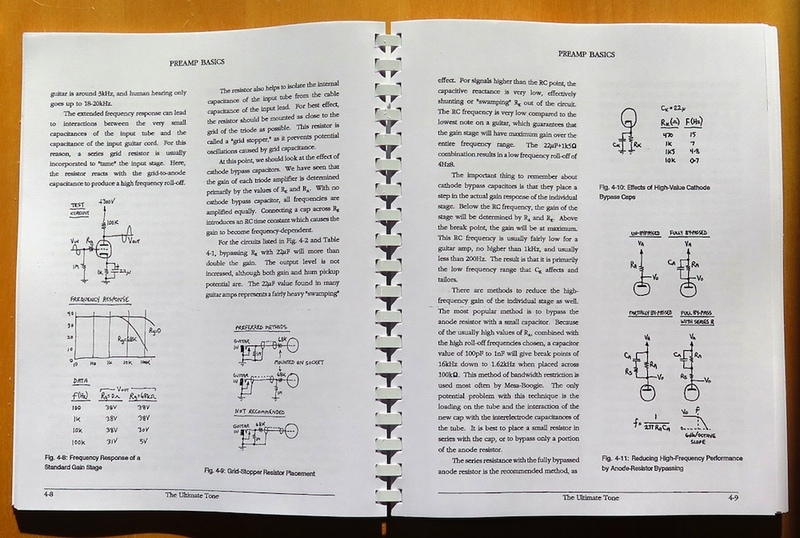 This is the book that jump-started the boutique tube guitar amp business! Learn the truth about tube preamp design and modification; see how tube power amps work and how they can be made more reliable; see how reverbs and effects loops work and learn better ways to configure them; learn why some amp brands are easier to service and to mod than others; see how simple switching circuits are but how capable they can be. Tube data for the common types used in guitar and bass amps is provided, along with a discussion of stage set-up and player ergonomics. The Ultimate Tone has become an industry standard since its release in January 1995. TUT itself is an overview of all-things-guitar-amp. 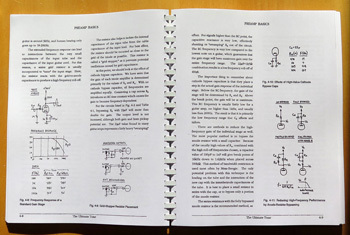 Much of its information is accessible to hobbyists of low- to moderate-skill, while other parts require some schematic reading fluency and circuit knowledge. The Ultimate Tone offers the technician or hobbyist a wide information base for properly implementing guitar amplifier modifications, and to simply build better guitar amps. Sonic perceptions and stage setups are analyzed to demonstrate how optimal sound can be obtained from existing equipment. A survey of amplifier brands follows, with an eye toward ease of modification and service. Basic vacuum tube operation is clearly presented, as are power supply principles. Preamp circuits and master volumes are explored with a discussion of guitar sustain and interactions, for clean and distorted tones. Power amplifiers are investigated, and power tubes are explored regarding choice of tubes, relative reliabilities of tube types, the relevance of tube matching, and the sonic impact of each tube type. Methods of improving reliability are presented. Tube and solid-state effects loops and reverb loops are investigated, with relative performance issues highlighted. The Best All-tube Effects Loop shown here has been widely copied throughout the industry, as has the jfet-mosfet cascode loop. An extensive discussion of switching methods is presented, a subject which is rarely explored with regard to guitar systems. Channel, reverb, effects, lead boost, mute and speaker switching are explored. Foot-switch controllers with and without LEDs are detailed, with an eye to multiple controllers for larger stages. Tube data is provided for the seventeen most common types used in guitar amplifiers, with pin-outs for nine less common numbers. Replacement transformer data is provided for the two Hammond Mfg. model lines which cover most guitar applications. The intended reader must be able to work from a schematic.